Photo courtesy of WTL photos. Ellie couldn’t get married in her father’s church. Not the Father, just her father, God’s enforcer of commandments, confession and communion, said it couldn’t be done. Never mind that six months earlier her uncle, married 40 years, paid a priest to annul his marriage in order to remarry. Never mind that his six adult children, now all bastards in the eyes of the Pope, weren’t there to watch him stand at the altar with a wafer of Christ stuck to the roof of his mouth and kiss his wrinkled bride. No, her dad said, no matter what the state said, in the eyes of God, Frank was still married, and therefore couldn’t marry Ellie in the family church with his two small sons as witnesses. Ellie’s dad had built the church right next to her grandfather’s mobile home and just 50 feet from her own family’s double wide. It was a squat building with a steeple that cast a long, wavy shadow across a desert ruled by dust devils, fierce, erratic winds that tore at their trailer’s tin siding, and blew sand through the window cracks so that Ellie woke in the morning with grit in her teeth. But once when she was nine she woke to a miracle of angels’ wings, of a wind that carried sand from the four corners of the desert and built a mountain in her yard. She ran outside in her nightgown and joined her brothers and sisters climbing the slope, bare feet sunk deep into the mountain’s soft sides until, breathless and hot, she reached the top where she was high enough to see over the roof of the family’s trailer. Eventually the mountain melted into hill, then puddle, and finally was nothing but a shovelful of sand that her father mixed with cement to form the foundation of the church. Figuring that the mountain was a sign from God, the church was built on the same spot. They filled it with statues of the Virgin Mary, hung a crucifix of Christ writhing in agony upon the cross, and hired a retired priest to come out once a month and mumble a service in Latin. Ellie loved the church. She loved the black lace she pinned to her hair, loved the narrow, creaking stairs to the loft where she and her sisters, and sometimes an aunt and cousins from Carson City, sang Ave Marias and Kýrie, eléisons, their clear, high notes disturbing the fine sand blown in by the wind so that music and dust floated down onto the bowed heads of the (forgiven!) sinners. But she wouldn’t be married there. Instead, she was getting married at the Senior Center, built a few months ago but already smelling of old people. She had risen early and driven over to the center to air it out. She opened the door and wrinkled her nose at the smell of fish sticks and peppermint and urine. Quickly, she walked past tables and folding chairs that had been set up the night before, past the D.J.’s equipment, and the long table where the wedding party would sit and face the guests. As she went, she opened windows to let the wind in, the sand in. She inhaled the hot air, sweetened by sage and tumbleweed, and stopped at the card table where the wedding cake would sit. She lifted the heavy silver knife that she and Frank would use to cut the cake. Frank and his boys. The three had to sample every cake in the bakery before settling on spice. Spice cake with cream cheese frosting, she had won that round at least. She locked the door and headed home to get ready for the wedding. The ceremony was over in 10 minutes. Ellie had spent the whole time trying to remember the name of the man marrying them. Frank had introduced her a week earlier, told her who he was, but now as she stared at his red nose and cowboy shirt, smelling whiskey, she missed her cue, and Frank had to squeeze her hand to prompt her. “Oh!” she cried. “I do.” And the guests laughed and the county commissioner? Judge? Bartender? laughed too. And she smiled up at her husband as he bent down and kissed her. Friends filed past her and Frank and the boys, a family now. When her new sons grew tired of the compliments and handshakes, they joined the other children sliding across the dance floor in their socks, amusing the women who tapped their feet in time to the music and eyed their men, who were tipping back their chairs, tipping back their beer bottles. Ellie danced, with Frank, with her father, with her sons, holding their small hands and dancing in a circle, her dress swirling about their feet, tripping them so they fell in a fit of giggles to the floor. And then it was time, the D.J. said, to make a toast and cut the cake. Children squeezed through the crowd to get to the front of the cake table. Couples who had slipped out in search of dark corners of the desert and soft sand to push their bodies into wandered back inside. Frank and Ellie wrapped their fingers around the knife and cut the cake. “Should she be nice, folks?” the D.J. asked as Ellie tossed back her head and laughed, smooshing the cake into Frank’s face. Frank didn’t wait for the D.J.’s prompts. He took his own piece and pushed it into Ellie’s face, her head snapped back, she stumbled and was caught by her dad. Smiles. Glasses. Eyes. Laughter. All froze. Ellie’s father pushed her behind him and turned back to Frank. Ellie moved past him, reaching for napkins to wipe away the frosting, praying she could erase the angry look on her husband’s face, praying for the wind to bury her in sand. 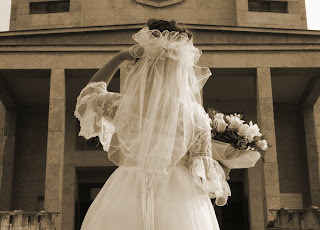 In response to Sunday Scribblings‘ writing prompt: Weddings. Good story rach-I wasn’t expecting her husband to be so vindictive. Great story with a surprise twist at the end. A line no woman should have to repeat in defence of her husband’s violent behaviour.